Cox Technic is an evolving system of evidence-based protocols to enhance the chiropractic spinal pain relief clinical outcomes. Dr. Cox passionately studies the published medical research about spinal examination, biomechanics, diagnosis and various approaches to spinal pain relief. He appreciates your enthusiasm in studying with him. For more information about these recorded Cox Technic Webinars, please click here. This is the second in the educational Cox Technic Webinar Series. 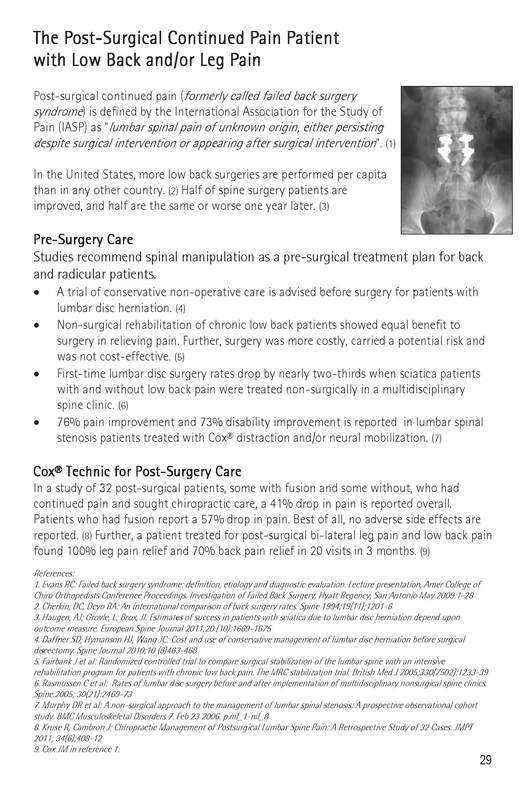 Dr. James Cox presents a webinar on the care of the post-surgical pain patient who has had spinal surgery and now has continued spinal pain. Widely known as the failed back surgical syndrome patient (FBSS for short), these post-surgical continued pain patients are demanding of chiropractic's conservative skill. Most patients have had a surgery - or several - and either don't want another surgery or can't have another surgery and want pain relief, any amount will do. These patients well appreciate the 50% or 80% or 90% (sometimes even 100%) relief they get under the Cox Technic chiropractor's care. Cox Technic protocols outline the protocols to follow in treating these patients who have hardware in their spines or not. Join Dr. Cox for this discussion on July 13, 2011, at 12:30pm EST for his presentation in talk and imaging on the FBSS patient. For more information and registration, please see http://www.coxtechnic.com/doctors/cox-technic-webinar-series.